There are two wonderful luaus on the island of Kauai. Luau Kalakaku is held on Tuesdays and Fridays.This luau is located on a 35-acre sugar plantation owner’s estate, Kilohana. Built in the early ’30s, it was Kauai’s first mansion. Smith’s Tropical Paradise Luau is memorable for its unique river-side location and local flair. Located along the beautiful Wailua River in a rich, tropical garden, Smith’s offers one of the most spectacular luau settings in Hawaii. You’ll want to arrive early so you can stroll through the meandering pathways where you’ll see lagoons teeming with fish, exotic peacocks, rare “singing tree ducks,” and over 20 types of fruit trees. If you’re in the mood, you can buy a tram ticket for a narrated tour of the grounds, which begins at 5:30pm. 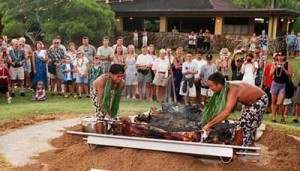 At 6:00pm, you can watch the unearthing of the traditional pig during the Imu Ceremony. Your succulent dinner has been cooking all day in the underground oven! Then, Mai Tais (an Island favorite), beer, wine, standard bar drinks, and soft drinks are served, as tables go one at a time through the international luau buffet. You will be entertained with wonderful Hawaiian music and humor throughout the dinner hour. After the feast, the conch shell blows and the torches are lit at the Lagoon Amphitheater for the start of Kauai’s most spectacular show! Night blooming lilies open before your eyes as the Hawaiian Goddess of the Volcano, Pele, dramatically emerges from the fiery lava to tell her story. Their International Pageant will immerse you in a colorful festival of dances, showcasing the various ethnic groups that have come to call Hawaii home. Enjoy dances and songs from Tahiti, Hawaii, China, Japan, the Philippines, New Zealand and Samoa. 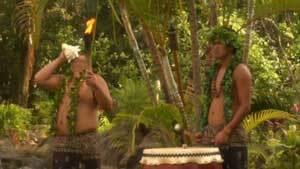 The lush garden setting, the fabulous food and great entertainment make this luau a must on your visit to Kauai. Photos courtesy of Smith’s Tropical Paradise Luau. 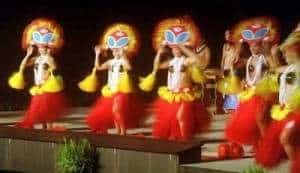 Located on the historic grounds of historic Kilohana Plantation, just outside Lihue, you will not want to miss this spectacular theatrical, yet traditional luau filled with fun, festivities, and entertainment for the entire family. Graceful hula dancers, fire poi ball twirlers, traditional fire knife dancing and a lavish buffet of local delicacies come together for a delightful experience on Kauai. You may want to come early to explore the Kilohana Plantation… stop at the local arts and crafts demonstrations, stroll the shops, catch a ride on the historic Kauai Plantation train, or even ride the Clydesdale Horse Drawn Carriage available on the stunning grounds. Photos courtesy of Luau Kalamoku.